Post written by Michelle J. Alfa, PhD, from the St. Boniface Research Centre & University of Manitoba, Manitoba, Canada. The focus of our study was to develop a model that would mimic the accumulation of organic material and bacteria that occurs in patient-used endoscope channels when biofilm develops after repeated exposure to high-level disinfectants such as glutaraldehyde that “fix” any residual material left after cleaning. The recent publications about outbreaks of multi-resistant bacteria have demonstrated that contamination within endoscopes can be persistent and difficult to totally eradicate. There are also some reports that this persistent contamination occurs despite following the manufacturer’s instructions for use. The current approach to validation of cleaning instructions that manufacturers follow does not take into consideration biofilm formation. As such we wanted to develop a model for biofilm accumulation that would mimic the repeated rounds of cleaning and disinfection that may lead to multi-layered accumulation of fixed material that may protect bacteria from high-level disinfectants (ie, build-up biofilm(BBF)). 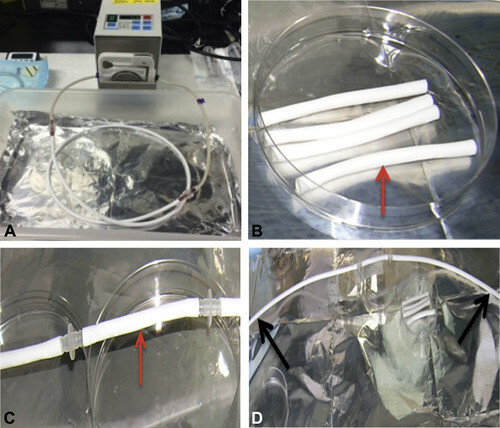 This type of model will allow assessment of how well the MIFU for cleaning flexible endoscopes can remove such BBF as well as determine the effectiveness of the MIFU for disinfection when bacteria are embedded in BBF. The gastroenterology specialists who perform endoscopy procedures trust that the endoscope they are using is not contaminated and is safe to use. We are seeing that this is not always true, and we need appropriate models to better understand why persistent contamination occurs and how to prevent it. Figure 1. Apparatus for BBF formation in PTFE channel and SEC assembly. A, PTFE tubing was attached to a peristaltic pump to circulate fluid through the PTFE channel. The PTFE tubing was removed from the pump tubing for all manipulations outlined in Table 1. B, The fully formed PTFE-BBF channel was aseptically cut into 7-cm segments. One of these segments (red arrow) (C) was attached to 2 sterile PTFE flanking portions (black arrows; D) using sterile linkers to form the SEC assembly that was 127-cm long. For destructive testing the PTFE-BBF center segment was aseptically cut from the SEC apparatus providing a 5-cm segment that could then be evaluated. For channel sample collection (with or without brushing) sterile reverse osmosis was flushed through the entire SEC unit and collected in a sterile container. BBF, Buildup biofilm; PTFE, polytetrafluoroethylene; SEC, surrogate endoscope channel. The data from our BBF model showed that low levels of Enterococcus faecalis and Pseudomonas aeruginosa can survive within the BBF. These BBF-embedded bacteria cannot be eradicated by full 20-min exposure to glutaraldehyde. Furthermore, scanning electron microscopy showed that the BBF that develops visually mimics the material has been reported to accummulate in patient-used endoscope channels. Of great interest is the finding that when the channel containing BBF is stored dry over a number of days, the level of P.aeruginosa increases dramatically (up to 7 Log10 increase in viable count) suggesting that the damaged bacteria are able to repair themselves. The recovery of viable but non-culturable bacteria to the culturable state has been previously described. This phenomenon may be the basis for persistent contamination in endoscope channels that may result in channel cultures being culture negative initially but showing growth when cultures are taken on subsequent days. We believe this BBF-PTFE model will provide a more realistic challenge to determine which protocols can prevent the formation of this BBF matrix or can eradicate this matrix once formed (ie, remediate endoscope channels that may already have BBF present). However, even the best reprocessing protocol can be negated if the endoscope is stored with even small amounts of moisture in the channels. As such it is ideal to store endoscopes in channel-purge storage cabinets where air is flushed through all channels to ensure total drying during storage of endoscopes.